Credit scores are a quick way for banks, insurance companies, and others to rank us based on our past behavior. Keeping track of your credit score is an important way to monitor your progress towards a better financial future. But how do you get a free FICO credit score? There are actually many ways how to check your credit score for free. Follow along, and I’ll show you how. Which credit score will a bank use? FICO vs VantageScore: What’s the difference? Should you pay to get a Credit Report? What is the best way to get a free credit score? As you read this article, keep in mind that there are actually many different credit scores. FICO is the most widely used credit scoring model, but it is not the only one. I love earning credit card rewards so that my family can travel for free. Here are some of our favorite rewards credit cards and the credit scores that each bank uses when you apply. When you know which credit bureau profile the bank will pull, it will allow you to be laser-focused on making sure that credit score is as high as possible before you apply. Did you notice that the credit bureau that the credit score was pulled from varies based on the bank issuing the credit card? Some banks even pull credit scores from multiple credit bureaus! The FICO model is the most popular credit score for banks to use. Below are some of the best rewards credit cards that use the FICO credit score to underwrite your application. Although there are 3 credit bureaus, you can see that each credit bureau is using FICO score version 8 for these credit cards. Some banks use another version of your credit score is called a VantageScore. It is similar to a FICO score. You’ll notice that each of these credit cards uses the Transunion to pull your VantageScore to make a credit decision on your application. And Chase uses a different version of the Vantage score for the 3 different credit cards on this list. Credit card rewards are great, but sometimes getting cash back is even better. Here are some of my favorite cash back credit cards that use the FICO credit score to underwriter your application. All of these credit cards use FICO score version 8, but each bank pulls your information from a different credit bureau. Some people prefer cash back credit cards because their rewards can be used for anything, instead of just towards booking a vacation. Here are the best cash back credit cards that use the VantageScore to make a decision on your application. Again, notice that, although the information is coming from Transunion, the credit scoring version will vary based upon the credit card you are applying for. The better you perform in any one of these categories, the higher your score will go. The three credit bureaus – Equifax, Experian, and Transunion – collect information from banks, credit unions, and other agencies to create your credit report. This information is shared with lenders, business, and and consumers when they request it. A lender or business can only view your credit report if you give them permission (hard inquiry) or if they have an existing relationship with you (soft inquiry). The bank then applies the FICO or VantageScore model to your credit report information to determine your credit based on the risk factors that are most important to them. Why does my free FICO credit score keep changing? Many people believe that a credit score is a number that doesn’t change. This is completely false. Credit scores are constantly changing. I like to view them as a living, breathing animal that could move at any minute. There are two reasons why your credit score is constantly changing. The first is that people who have lent you money report their information at different times throughout the month. Most often, a bank will report the balance, payment status, and other related information soon after your statement closes. Others simply assign you a specific day of the month. Second, when you view your credit score, the website or app that is providing it to you is pulling the data from FICO or VantageScore on a different day of the month. Below, I share some screenshots of the free FICO credit scores I received from my current banks and almost every one of them was as of a different day than the others. These two facts are reminders that you should behave responsibly with your credit all of the time, not just when you are getting ready to apply for a loan. You never know when you will need to apply for credit and you want to make sure that your credit score is as high as possible when you do. FICO vs Credit Score: How are they different? You may be asking yourself, what is the difference between FICO and a credit score? Credit scores are the broad, generic term for the number assigned to you based on your credit history and risk factors. FICO, on the other hand, is an abbreviation for the Fair Isaac Corporation. FICO is a company that specializes in predictive analytics. In plain English, it means that they take your past behavior and use that to predict how you’ll act in the future. People who have paid their bills on time and have been responsible with their credit receive higher scores. And those higher scores increase the likelihood that they’ll get approved on their next credit application because bank assumes that they’ll continue to act responsibly. FICO itself is not a credit reporting agency. The three main credit reporting agencies are Equifax, Experian, and TransUnion. They collect data from banks, lenders, utility companies, and other companies that you make payments to. The credit reporting agencies then provide the data to FICO. FICO uses that historical information to calculate credit scores. The FICO credit scores are then shared with banks, consumers, and other agencies when it is requested. In the FICO scoring model, information provided by the credit bureaus is weighted with a tilt towards payment history (35%) and credit utilization (30%). The length of credit history (15%), the number of recent inquiries (10%), and the mix of credit (10%) also play a factor in the calculation of a credit score. FICO is now working with version 8 of their credit scoring model. They have released a version 9 that does not penalize consumers for paid collection accounts and minimizes the impact of unpaid medical bills. However, very few banks and lenders have started to use FICO version 9. FICO and VantageScore are competing technologies that calculate credit scores. FICO is the established leader in credit scoring. VantageScore is relatively new and is on version 3 of their scoring model. 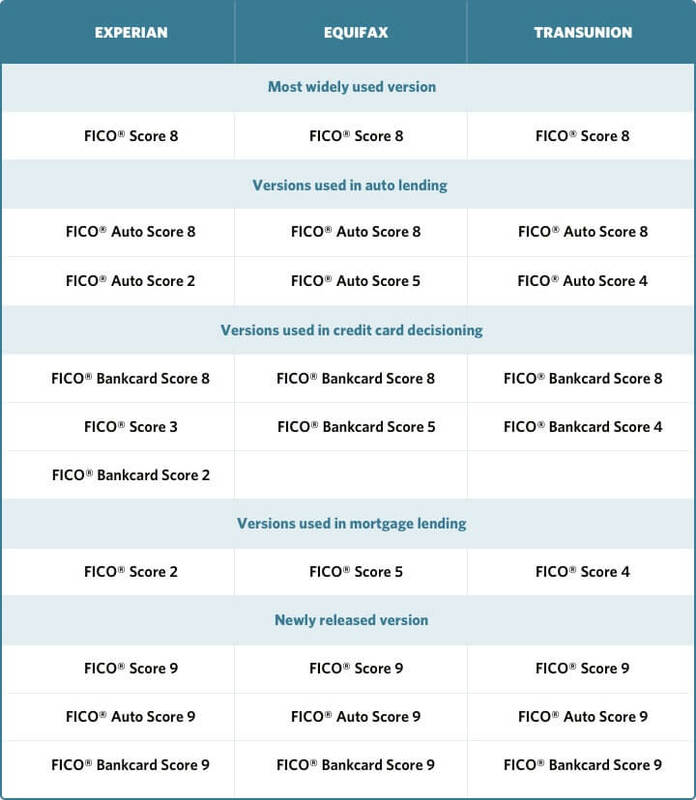 Both FICO and VantageScore have multiple versions of their scoring model, some which you can see in the charts above. Honestly, with all of these versions, it can be quite confusing. This is especially true when someone says “credit score” without being more specific as to which score they are talking about. To make matters worse, there is the general FICO score, but then there are other flavors as well based upon which type of loan you are applying for. There is a different FICO version 8 for auto lending, credit card decisioning, and mortgage lending. It may seem silly that there are different models for different lending purposes, but each of those categories is concerned with different aspects of your credit profile. So, it makes sense to have a customized model that caters to their focal points instead of relying on something more generic. Because many lenders tend to be conservative, these custom models allow them to be more confident in approving your application. Similar to FICO, a VantageScore is calculated with some categories weighing more than others. The ratios are different than FICO as well. For example, a VantageScore weighs payment history higher at 40% (vs 30% for FICO) and utilization at 20% (vs 30% for FICO). Not only do FICO and VantageScore calculate credit scores differently, the ranges of what qualifies as Fair, Good, and Excellent also vary. FICO ranks their best credit scores starting at 740 (740-799 Very Good, 800-850 Exceptional), whereas the top VantageScore credit scores range from 750-850. As you can see in the chart below, the tiers are different for each scoring model. Additionally, the new model focuses on trending of consumer behaviors to give lenders a better understanding of the direction of a consumer’s credit report. For example, is an applicant running up balances or paying them down? Wouldn’t it be nice to have a lender recognize and reward your positive momentum in paying off debt, even if you haven’t achieved your goals yet? VantageScore 4.0 also seeks to accurately score people with a limited credit history. Sometimes there isn’t enough financial data to provide a realistic credit score on someone. With machine learning techniques, VantageScore is seeking to solve that problem with it’s 4.0 release. Now that you know all about how credit scores are calculated, you have to be asking about how to check your credit score for free? You can get your FICO score free from one of these many options below. And some of them don’t even require you to be an actual customer of the bank. Obviously, they hope you’ll be impressed and will think of them first the next time you apply for a loan, open a bank account, or sign-up for a credit card, but that isn’t required. Here’s how to check your credit score for free. Some of these non-credit card monitoring services do not use FICO or VantageScore models. They have created their own proprietary models that simulate FICO scores. Even though they are not FICO scores, that doesn’t mean that these services are not valuable in your efforts to improve your credit score (or try to get the perfect credit score of 850). I like to call these non-FICO services “directionally correct.” That means that if you are doing the right behaviors, these services will reflect your score going up. The important thing to remember is that when you check your credit score using one of these methods, it will not affect your credit score. Although the data is usually updated once per month, you can literally get your free credit score every day without causing your score to go down. CreditKarma.com is consumer information website that allows you to get your free credit score from two bureaus – Transunion and Equifax – using VantageScore 3.0 calculations. Credit Karma provides monitoring when there are changes to your credit report and provides personalized insights about how to improve your credit score. CreditSesame.com is another consumer information site that provides a free credit score from Transunion using VantageScore 3.0 formulas. Credit Sesame offers free identity theft protection and also monitors your credit for changes. You can monitor your finances over time and receive powerful insights about what is impacting your credit score. Quizzle.com is owned by BankRate.com, a bank account and loan comparison website. Quizzle offers both your credit score and your credit report from Transunion using VantageScore 3.0. There are several credit builder tools and you can even dispute incorrect information directly from their site. Chase created Credit Journey for personal and business customers and others who are not yet a client of Chase. It provides a free credit score and credit report from Transunion using the VantageScore 3.0 model. It provides weekly updates to your credit score and report without affecting your credit. Plus, you’ll receive updates whenever there is a critical change in your credit report. A credit score simulator is also available to estimate how your credit score would change based on specific actions you might take. Credit.com is updated every 14 days with Experian data. They provide specific recommendations on how to improve your credit based on your individual credit report. You’ll also receive expert guidance about how to make the most of your financial opportunities. Capital One offers Creditwise for everyone, whether you are a customer of Capital One or not. (Psst, you really should be. They have great cash back and rewards credit cards). With Creditwise, you’ll discover the key factors impacting your credit score, receive alerts whenever your credit report changes, and they’ll even track the “dark web” for your Social Security number to help reduce fraud. The Discover Credit Scoreboard is one of my favorites of the free credit score providers. Because, not only does it provide your free Experian credit score, it also provides other useful information. Its summary shows how many accounts you have, the length of your credit profile, the number of inquiries the last 24 months, your utilization ratio, and if you’ve missed any payments. All of these pieces are critical to focus on when seeking to improve your credit or reach a perfect 850 FICO score. American Express offers their free tool called MyCredit Guide. The MyCredit Guide is available whether you are a customer of American Express or not. With this tool, your free credit score is updated on a weekly basis with Transunion data using the VantageScore model 3.0. Not only does it provide a free Transunion credit score, it also provides your Transunion credit report. And there are alerts to help detect identity theft and fraud. What about Free Government Credit Reports? Although you can receive your free credit report from the Federal government’s website, AnnualCreditReport.com, you will not receive a free credit score. By law, you are eligible to receive one credit report from each of the three credit bureaus once every 12 months. I set a Google Calendar reminder for myself to pull free credits for my family and me the beginning of every January. It is important to review your credit report once a year to ensure there are no mistakes. Then, combine that detailed credit report information with the free credit scores from the resources above to get a complete picture of your credit profile. There are many credit cards and banks that provide a free credit score. Banks want you to be a good customer and stay on top of your finances so that you will be able to pay them back. By offering a free credit score, it is simple way that banks can make you aware if you are doing the right behaviors (score going up) or if you need to make some adjustments (score is going down). Here’s how to check your credit score from a bank or credit card company. Usually, you will have access to your free credit score using their mobile app or website. American Express provides a free credit score to all consumers, whether you have a credit card with them or not. Bank of America offers free credit scores to anyone with a personal credit card. Barclays also offers this benefit to all consumer cardholders. Chase automatically provides a free credit score to Slate customers. Citibank gives consumer credit card users a free credit score. Capital One uses their tool CreditWise to provide free credit scores to all consumers. Discover was one of the first to offer this benefit to all consumers, even if they don’t have a Discover card. HSBC now offers free credit scores to all consumer credit cardholders. Some credit unions offer free credit scores to their members. Credit unions are usually non-profit organizations that are owned by their members, therefore they are on the leading edge of offering these types of benefits for free. FICO and other online services offer to provide your credit report for a fee. Although you can get a free credit score from the websites above, many people are unsure which steps to take to improve their credit score. Knowing what steps to take to improve your credit score can be confusing. Sometimes, you make a move that you think will give your score a boost, but your score goes down instead. Talk about frustrating! That’s why I recommend you talk to a professional who knows all of the credit score secrets. They work with people just like you every day and can help them achieve their credit score goals. For example, if you want to buy a home, getting your credit score as high as possible before you apply for a mortgage can literally save you thousands of dollars over the life of your loan. Raising your credit score just 1 or 2 points could mean the difference between getting approved or not. The Federal government requires that each of the three major credit bureaus – Equifax, Experian, and Transunion – provide you one copy of your complete credit report for free each calendar year. You can request a copy of your credit report at AnnualCreditReport.com. You do not have to request all three reports at once. You have the option of requesting one or two credit bureau reports today and the others at a later time. Unfortunately, AnnualCreditReport.com does not provide a free Equifax credit score, a free Experian credit score, or a free Transunion credit score. You will have to pay or use of of the free resources mentioned above to receive these credit scores for free. Do not be confused by other similar websites. Those copycat websites will request your credit card information for your “free” credit report, then bill you after a short trial period is over. If you’ve been declined for a credit application, you can also request a free copy of your credit report. The decline letter will provide a semi-generic reason why you were declined, then offer the ability to receive a copy of your credit report. The combination of the letter and a complete copy of your credit report will help you understand what steps to take to improve your credit score. If you need additional help, take a look at the free tools discussed above or speak to a professional who can provide guidance specific to your situation. Although there are many ways to check your credit score for free, I personally recommend getting both a free FICO score and a free VantageScore because both are used by lenders. My personal favorite is the Discover Credit Scorecard, which provides a free Experian credit score. FICO is the credit score that the majority of lenders use. VantageScore is being used more frequently, so you can’t ignore it. If you are working to improve your credit score, there can be value in the free credit reporting tools because they may provide additional tips on how to improve your credit score. But, remember, these scores are not the same as FICO or VantageScore. They do provide good advice, but their scores are not the same as any lender will use. Professional help can be valuable to help you increase your credit score. They work with people just like you everyday and can offer valuable advice how to improve your credit score quickly. Their advice will increase your approval odds and could save you thousands of dollars in interest on your next loan. How do you keep track of your credit score? What steps are you taking to improve your credit? Let us know in the comment section below.